← A matter of credibility. Last year, she started out with a single shot Crickett, now she’s ready for a 10-22 Tactical. 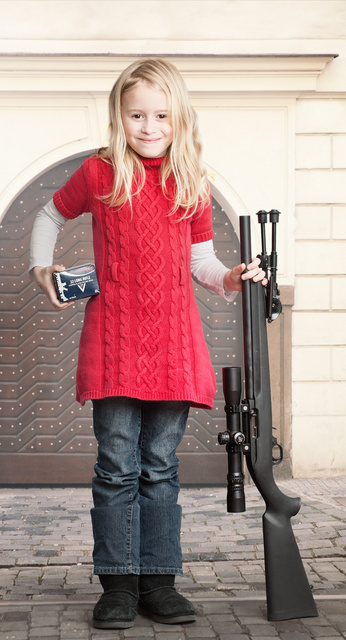 In today’s market, the box in her left hand might be worth nearly as much as the rifle. I think Garibaldi would have been proud to claim her as his own. This entry was posted in ammunition, rifle, weapon and tagged 22LR, girl, little, red, semi-auto. Bookmark the permalink. Particularly since one of the illustrations shows a woman soldier, which the U.S. is currently arguing about. Looks like a still from “Leon” to me. Good. I always loved play of Reno and Portman there. At a gun show this weekend, I saw two of those boxes traded for a Mossberg Model 45 .22 rifle. To nitpick….the box is not in her left hand, the rifle is (and based on the box it doesn’t like like the photo has been reversed). I’m glad she was able to obtain ANY .22 ammo! The only thing I find is stores is birdshot and blanks. As to the rifle, our family has used a reduced-sized 10-22 stock purpose-bought years ago, reduced it myself; did the same with a bolt-action Marlin. We’ll keep those stocks for the grandkids should we be blessed with them, and their parents agree.